Do you have files (documents, videos, pictures, audio, etc.) or folders that contain sensitive, confidential or personal content or information and don't want other people to have access to these files? Then you should password protect (encrypt) your secret files and folders and this tutorial will show you step by step how to do this in a few different easy ways using free software in Windows, a free app on Android and in Linux Mint and Ubuntu. This tutorial will also show you how to encrypt your files and folders and hide them inside audio files (songs) which can be played on every music player (like the character Elliot does in the tv series Mr.Robot). Encryption is the process of encoding data in such a way that only people who have a secret key or password can access it. Encryption is the most effective and safe way to protect your sensitive, confidential or personal data because you will need a secret key or password to decrypt an encrypted file or folder. When you encrypt your files or folders, you can securely store your data on your computer, USB device or even send by email. 7-Zip is a free program for compressing files and extracting compressed (zipped) files. You can also use it to password protect (encrypt) files and folders. You can download 7-Zip here (Windows XP, Vista, 7, 8, 8.1 and 10). If you want to encrypt multiple files at once then it's a good idea to place them into a folder and then encrypt the entire folder. 1. Go to the file or folder you want to encrypt. 2. 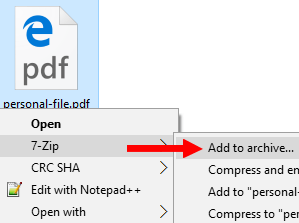 Right-click on the file or folder, go to 7-Zip and choose Add to archive. 3. At Archive format, you select zip. 4. At Encryption, you enter the password of your choice twice. 5. 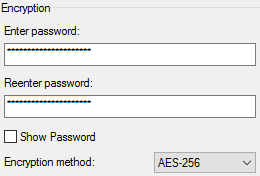 At Encryption method, you select AES-256. 7-Zip will now zip and password protect (encrypt) your file(s) or folder(s) or both. Note: It is very important to remember your password because you will need it to get access to your encrypted data. To decrypt an encrypted file you can use any compression program, like WinRar, WinZip or 7-Zip. 1. 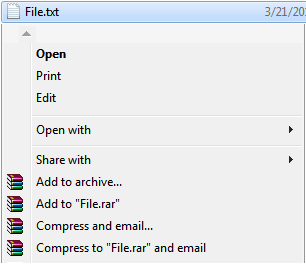 Right-click on the encrypted file and choose Extract here or Unzip here or go to 7-Zip (or another file archiver program, like PeaZip) and choose Extract here or Unzip here. Your encrypted file or folder will be decrypted. WinRAR is a program for compressing files and extracting compressed (zipped) files. You can download WinRAR here (Windows XP, Vista, 7, 8, 8.1 and 10). 2. Right-click on the file or folder and choose Add to archive. 3. 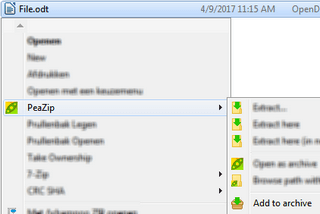 At Archive format, you can select an archive format, like RAR or ZIP. 4. Click on the Set password button. 5. Enter the password of your choice twice. WinRAR will now password protect (encrypt) your file(s) or folder(s) or both. Ashampoo ZIP Free is a free program for compressing files and extracting compressed (zipped) files. You can download Ashampoo ZIP Free here (Windows XP, Vista, 7, 8, 8.1 and 10). 2. 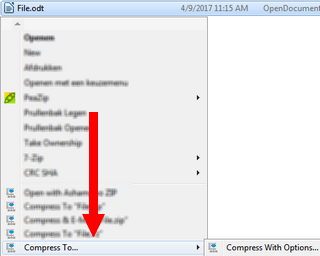 Right-click on the file or folder, go to Compress To and choose Compress With Options. 3. At Encryption, you select AES-256 Encryption. Ashampoo ZIP Free will now password protect (encrypt) your file(s) or folder(s) or both. PeaZip is a free program for compressing files and extracting compressed (zipped) files. You can download PeaZip here (Windows XP, Vista, 7, 8, 8.1 and 10). 2. Right-click on the file or folder, go to PeaZip and choose Add to archive. 3. Click on Enter password/keyfile. 4. Enter the password of your choice twice. PeaZip Free will now password protect (encrypt) your file(s) or folder(s) or both. DeepSound allows you to encrypt your files and folders and hide them in audio files (songs) which can be played on every music player. It also allows you to extract your encrypted and hidden files directly from your audio files (songs). DeepSound uses the strong encryption algorithm AES-256. This is also the program that the character Elliot uses in the tv series Mr.Robot to encrypt and hide his secret data in music CDs. You can download DeepSound here (Windows 7, 8, 8.1 and 10). 2. Click on Open carrier files. 3. Go to the location on your PC where the music song is stored you want to use to hide your data in. 4. Select the song and click on Open. 5. Click on Add secret files. 6. Go to the location on your PC where the files or folders are stored you want to encrypt and hide. 7. Select the files or folders or both and click on Open. Tip: When you click on a song you can view at Free space for secret files how much file size in MB you can hide inside the selected song. If you have a lot of secret files, then you will need to divide them over multiple songs. 8. Click on Encode secret files. 9. Check the Encrypt secret files (AES-256) option. 10. Enter the password of your choice twice. 11. Click on Encode secret files. DeepSound will now password protect (encrypt) and hide your file(s) or folder(s) or both. 3. Select the music song that contains your encrypted and hidden data and click on Open. 4. Enter your password and click on OK.
5. Click on Extract secret files. Your encrypted file(s) or folder(s) or both will be decrypted. RAR is a free app for compressing files and extracting compressed (zipped) files. 2. 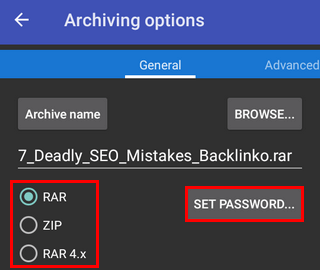 Go via RAR to the location on your Android smartphone or SD card where the file or folder is stored you want to protect with a password. 3. Select the file or folder you want to protect with a password. 4. Tap on the file + icon. 5. Tap on the BROWSE button. 6. Open the folder on your phone or SD card where you want to store the file or folder with password protection. 7. Tap on FOLDER ONLY located at the bottom. 8. Select an archive format (e.g., RAR, ZIP or RAR 4.x). 9. Tap on the SET PASSWORD button. RAR will now password protect (encrypt) your file(s) or folder(s) or both. 2. 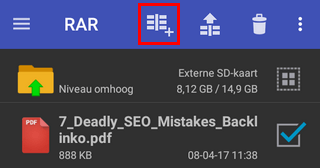 Go via RAR to the location on your Android smartphone or SD card where the file or folder with password protection is stored. 3. Select the file or folder with password protection you want to open. 4. Tap on the file + arrow up icon. 5. Tap on OK located at the bottom. 2. Right-click on the file or folder and choose Compress. 3. Click on Other Options. 4. Enter the password of your choice. 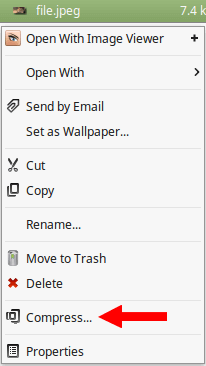 Linux Mint or Ubuntu will now password protect (encrypt) your file(s) or folder(s) or both. To decrypt an encrypted file you can use any compression program, like WinRar, WinZip or 7-Zip, but you can also do it in Linux Mint en Ubuntu without using any third-party software.